Ghanaian Instagram model, Pamela Odame Watara has revealed in an interview on Adom FM that she wouldn’t mind being Sarkodie’s second wife. According to Pamela, she likes Sarkodie for several reasons. She said Sarkodie's gentle nature being one of them and if they (She and Sarkodie) can reach an agreement she wouldn’t mind being a second wife. 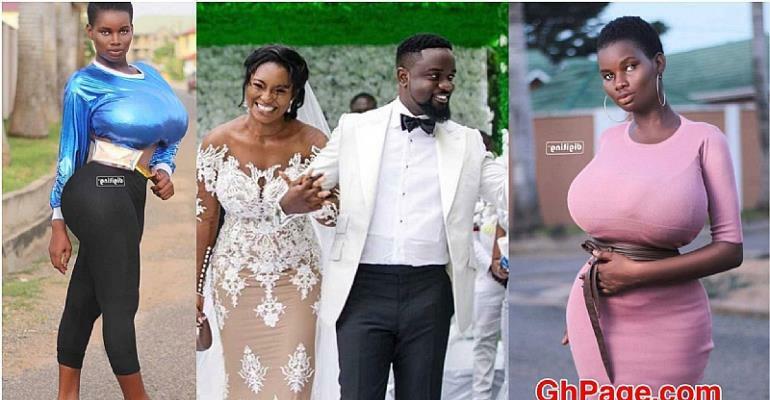 Pamela explained that, although she may not really like being the second wife of anybody, she can make an exception for the husband of Tracy Sarkcess any day. A few months ago the young lady’s masturbation videos got leaked on social media. In an attempt to deny the video, she got disgraced and exposed by the movie producer, Ola Micheal after she lied about being a student of Wisconsin University. Despite these major setbacks in her life, Pamela Watara keeps turning heads on social media and she has been cast in a couple of Kumawood movies.